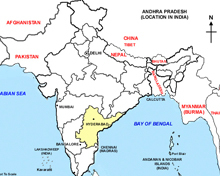 While Telangana, Maharashtra and Chhattisgarh cover its north-western side, Andhra has Orissa to its north and Karnataka to its west. Having the largest eastern coastline of 972 km in the country alongside Bay of Bengal, the state borders Tamil Nadu in the south. Two major rivers Godavari and Krishna criss-cross the state making the soil fertile and thus cultivation of a number of crops is possible in this region. A small enclave of 30 sq km, the Yanam district of Puducherry, is located in the Godavari delta in the northeast part of the state which includes the eastern part of Deccan Plateau as well a major part of Eastern Ghats. 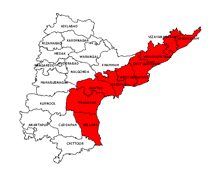 Coastal Andhra (districts on the coast) and Rayalaseema form Andhra Pradesh which has 13 districts in all. Anantapur is the largest district of the state and the 7th largest district in India with an area of 19,130 sq km. Each district is divided into a group of mandals, and each mandal has many villages. Visakhapatnam is the largest city followed by Vijayawada. Some of the important towns are are Kakinada, Guntur, Rajahmundry, Tirupati, Nellore, Ongole, Kurnool, Srikakulam and Eluru. The state literally boils in summer as mercury level climbs to 43-45 degree Celsius with high humidity. During the summer season (March-June), the moisture level is quite high and coastal areas of Andhra usually register higher temperatures than the interior districts. At certain places, the temperature even crosses 45 degree Celsius and any outdoor activity is wrought with the risk of dehydration and vulnerability to sun stroke, besides heat-related illnesses. The most expected monsoon season begins in mid-July with pleasant showers which will continue till September. Most of the rains occur in this southwest monsoon, while one-third of total rainfall occurs during north-east monsoon that begins in October. The winters in Andhra Pradesh are pleasant and attract most of the tourists from abroad and within the country. The winter season from October to February are not so cold, but comparatively pleasant feeling with Celsius in the range of 15 to 30 degree as the long coastline regulates the land temperature with active sea current. Andhra prefer cotton clothes which suit the climate of the region without any need for alterations during seasonal change. The new state of Andhra post bifurcation in June 2014 (that led to creation of Telangana) as selected Amaravati, an ancient town between Guntur and Vijayawada city and lying on the southern banks of Krishna river, as its new capital. Chief Minister Chandrababu Naidu has vowed to build a model city as the capital that would be a hub of economic activity, education and tourism. Amaravati once developed would have well-connected roads, highways, modern airport, railway as well as waterways and Singapore government is developing a master plan for execution. Located on Eastern Deccan, Amaravati has been a heritage site for Buddhist influence since 200 BCE. Lord Buddha was believed to have stayed in this place briefly and there are monuments and relics as proof of Buddhist tradition.